Travel to any of these gorgeous botanical gardens around the South and be totally amazed at the breadth of natural beauty on display. Perfect for a family-friendly vacation idea that won’t break the bank. Or, perhaps you and your significant other can enjoy these relaxed outdoor escapes. 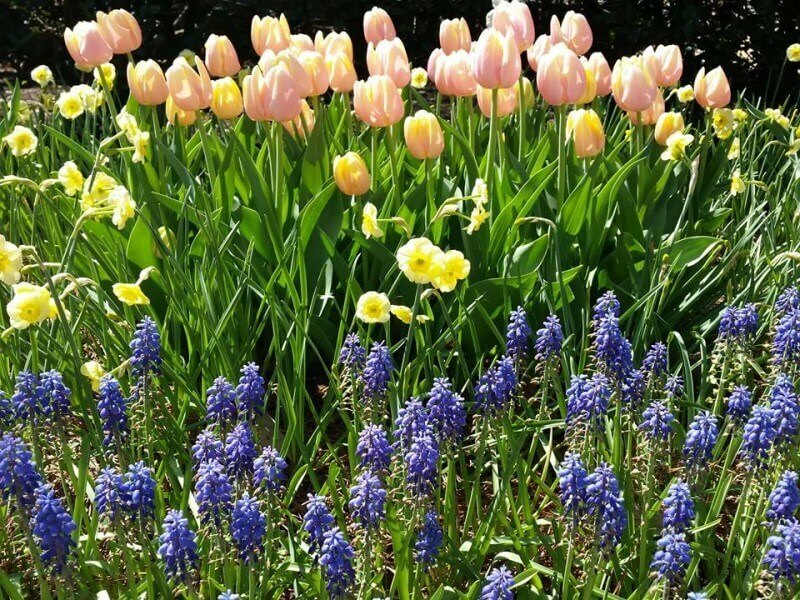 Decorated with an array of seasonal blooms, trees, statues, sculptures, bridges and other fascinating architectural elements, these botanical gardens and museums promise a full day of both recreation and repose! There are plenty of other gorgeous botanical gardens across the region that we have yet to visit, and we’ll be back showcasing more in the future as we have a soft spot for these gems! Click any of the hyperlinked gardens below for more information. With more than 12,000 different types of plants cultivated, Birmingham Botanical Gardens is teeming with wildlife. With gorgeous Japanese gardens, sculptural installations and manicured paths, there is so much to explore. They also boast the largest public horticulture library in the country for those looking to brush up on botanical trivia! Built in 1935, the historic Bellingrath Mansion in Theodore, AL, is surrounded by 65 acres of fantastic gardens. Adorned with salvaged brick, intricate ironwork and slated roofs, the home is open for tours and is an ideal backdrop for weddings and special events. Bellingrath has a variety of terraces that showcase an array of annuals, perennials, sculptures and architectural features. This 30-acre property in Hoover, AL, was the home to renowned horticulturalist Eddie Aldridge and his wife Kay. With plenty of outdoor activities offered, including birdwatching, fishing, hiking and dancing, Aldridge Gardens has something for everyone in the family to enjoy. They also offer great music and art events including outdoor concerts, art exhibitions and workshops. Huntsville is a total treasure to begin with including the US Space and Rocket Center and their GORGEOUS botanical gardens. The Huntsville Botanical Garden includes a butterfly house where you can have these fluttery friends land right on your hand. Also look for the Garden Railway, completely enthralling for all ages, but little boys who think they don’t like gardens will be especially entertained! The Dogwood Trail is beautiful year round, but with red leaves in autumn and white blooms in spring, it’s truly magical. Regarded as one of the best botanical gardens in the world, Fair Child Tropical Botanic Garden is a true paradise. Located in scenic Coral Gables, Fair Child is dedicated to conserving tropical plants and educating the world on this magical type of flora. With spectacular collections and exhibitions on display, they have over 34,000 species of plants available to view on their property. The Atlanta Botanical Garden is home to beautiful plants, great art and delicious food. Visitors can receive guided tours of the garden during the day, or come at night and enjoy live concerts, provocative art installations and special tastings composed by James Beard-nominated chef Linton Hopkins. They also have a great gift shop! Located in beautiful Pine Mountain, GA, Callaway Gardens is a historical, educational and charitable organization dedicated to connecting mankind to nature. The breathtaking property offers myriad recreational options including walking trails, a golf course, tennis courts, water sports on Robin Lake and road bike races. They also have one of best butterfly collections in the country, with more than 1,000 species on display. Developed in 1941 on Oldham County farmland, Yew Dell Botanical Gardens was founded by plantsman Theodore Klein and his wife Martha. From splendid topiary gardens to traditional English gardens, there are so many inviting spaces to explore at Yew Dell. They also offer great activity packages for families including craft workshops and gardening classes. The historic residence of the renowned Cheek family, Cheekwood Botanical Garden and Museum of Art is a breathtaking property that sits in the woodlands just west of Nashville. Not only do they have fantastic gardens with blooming flowers, but they also showcase exceptional art exhibits from internationally recognized artists. Cheekwood also offers great education programs, guided tours and has a terrific restaurant located on the premises. An overgrown pathway is a romantic feature at Cheekwood Botanical Gardens. Located just five minutes from downtown, the Knoxville Botanical Garden and Arboretum is lined with old stones walls and buildings, hiking trails, nurseries and display gardens. A historic plot barn located on the property was recently renovated and is now open to the public. The property sits atop a ridgetop and promises spectacular views of the Tennessee landscape. Well known for their fantastic education programs, the Memphis Botanic Gardens offers great activities in their “Big Back Yard,” a family garden designed for enjoying the great outdoors. They also have a world-renowned Japanese garden of tranquility as well as a newly constructed herb garden, which provides great opportunities for visitors. From family fun days to 10K races to live outdoor concerts, there is always something fun and festive happening at Dallas Arboretum and Botanic Garden. It sits on 66 acres of carefully groomed lands and has a wide variety of gardens including a Children’s Adventure Garden, a pecan grove, a stunning crepe myrtle alley and so much more! Continually voted as one of the best public gardens in the United Sates, Lewis Ginter Botanical Gardens has more than 50 acres of historic land with beautiful gardens that provides the backdrop for a variety of events. Known for their impressive variety of butterflies, visitors can see the Monarch butterfly waystation, which provides supplies to butterflies migrating across North America. Lewis Ginter also offers great dining and shopping! Savor the lazy days of summer and explore nature’s beauty that is available all around the South!